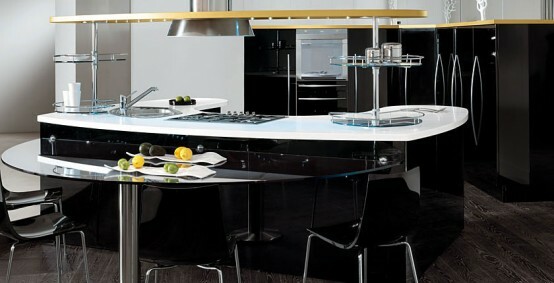 Kitchen designers starting to introduce curved shapes to the kitchen, just like other parts of the house. Gone are the days of sharp and straight and blocks look, as it’s now being replaced by soft appearance. The easiest way to add curved shapes and bump up your kitchen with a contemporary look is through the introduction of rounded sinks, maybe bowed cabinet, curved faucets. If you can afford a bit more, think about adding a curved kitchen island (be careful though, it better harmonizes with your kitchen still). If you can afford even more, look for a completely new set of kitchen furniture: this curvy-design range from Snaidero will grab your attention. This attractive kitchen features not only curves wherever you look, but it has clever storage options and one of the best-placed hood I’ve seen lately. 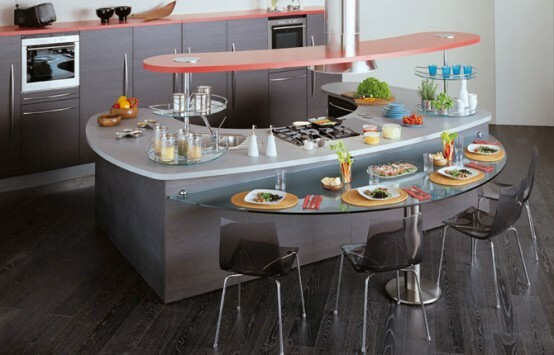 The name of this collection is Skyline and it provides a larger working space to cook your favorite meal. It’s available in a set of interesting finishes so it fits your house. Skyline also has corner models, so your corners won’t be empty if you don’t want to. Until recently kitchens were designed with a particular style and set of materials but the trend this year is to mix and match materials and styles to get your unique look. An example for you is to blend brick walls with stainless steel cabinets. If you’re really brave, you can use different cabinet styles too. Just don’t get over the top! The kitchen is traditionally a ‘work-area’, where utility is first, looks are second. However, as it also becomes (again, I would say…) the heart of the home, it better looks and feels good too. Artistic details, like molded cabinets, stylish handles, a small collection of things you adore enhance the look of your kitchen. For a brave new look, try adding a chandelier to your kitchen. Your countertop plays an important role, not just as a place to prepare food, but also to potentially dominate the look of the room. Instead of a plain, dark countertop, make the countertops show off with punchy colors and elegant surfaces. For added interest, complement it with matching tiles. 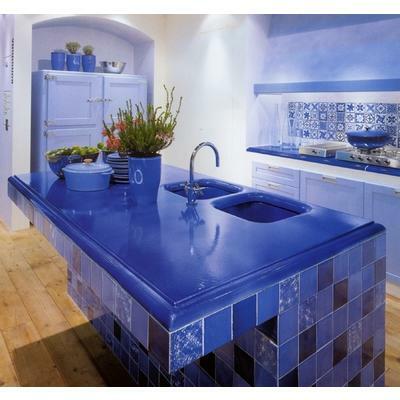 A good example is to use glazed blue lava-stone countertop with turquoise glass tiles the wall. Open shelves can bring back the nostalgia from the turn of the century (the one before the previous one 🙂 but it can also be very modern and sleek. I’ve just found that I wrote about open shelves in the kitchen before. mind prior to writing. I have had difficulty clearing my thoughts in getting my thoughts out there. seems like the first 10 to 15 minutes are lost simply just trying to figure out how to begin. Any recommendations or hints?